Vinton Firefighters speak with evaluators Saturday during the drill to explain and discuss how they handled the hazard material emergency. Part of the emergency hazardous material drill was handling medical injuries and implications from the hazardous material, so the facilitators that were exposed to the gasoline and involved in the wreck received simulated medical treatment. VINTON — Gallia County Emergency Management Agency held its annual hazardous material emergency training and certification drill on Saturday. 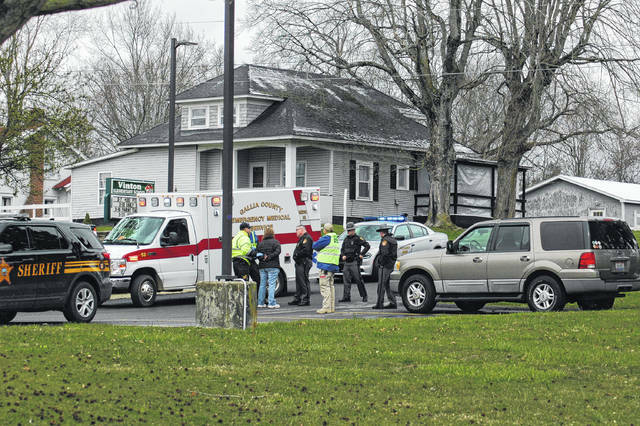 The event involved the Vinton Fire Department, the Gallia County Sheriff’s Office, the Ohio State Highway Patrol, Gallia County Emergency Medical Services, and was supervised by the Ohio EMA. The drill began at noon with a briefing and a call going out for a vehicle having struck a truck transporting gasoline that was leaking and one person reporting injuries. The incident was staged on the parking lot of Vinton Elementary, with vehicles parked as if they had wrecked and water spilled to simulate spilled gasoline. Deputy Chad Wallace was the first on scene, who observed that the operator of the passenger vehicle indicated some level of inebriation and was being intentionally difficult and hindering the emergency response. Vinton Fire Department personnel responded to the scene to contain the spill. EMS was dispatched to the scene to handle the injuries of the second occupant of the passenger car and to be on standby while the fire firefighters contained the leaking gasoline. As part of the drill, local EMA and Ohio Environmental Protection Agency (EPA) were contacted regarding the spilled gasoline possibly entering the flood waters. On hand were facilitators who simulated the accident as were evaluators who observed how emergency personnel responded to the scene and handled the incident. The Ohio EMA was on scene to guide the evaluators, who were given specific guidelines and areas to observe and report on. Lorie Haukedahl from Ohio EMA was on hand to coordinate with evaluators and to ensure the right data was gathered from the scene for evaluation later. Haukedahl gathered the information from evaluators Saturday and will process it into an after action report, which will be sent back to the Local Emergency Planning Committee (LEPC) for review and to make any changes to policy and procedure necessary regarding hazardous material situations. The drill, which is done annually is a requirement to maintain funding from the State Emergency Response Commission to maintain funding for the LEPC and is important for local agencies to maintain readiness in the event of an actual hazardous material emergency. 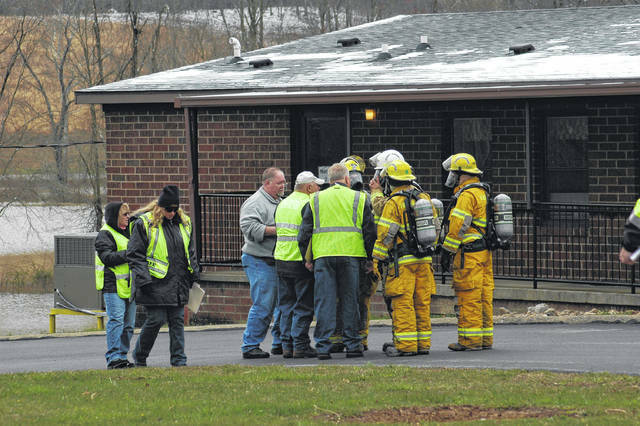 “We do them to help maintain and practice the county’s hazardous material response plan and to allow other agencies to practice their skills and emergency plans,” said Tim Miller of Gallia EMA. Local agencies and EMA will review the data and have a report back to local officials withing 30 days. According to Miller, the exercise went well.